Comic books have been the birthplace of many iconic characters in popular culture. Some of these have endured for decades, proving that engaging and imaginative characters can capture public interest for years to come. Of course, there are missteps every now and again. Scratch that, there are a lot of missteps, some of which are insensitive and downright offensive. In the 30s and 40s, Captain America and Superman were not only knocking out Hitler, but encouraging Americans to “Slap a Jap.” The lack of diversity in comics for decades made superhero rosters look like an Aryan propaganda poster. When black characters were finally introduced in the mid-60s, many of them had the word “black” in their codenames, for no other reason than to identify their race. Women have been sexualized and objectified. Religious groups, sexual orientations, and minorities have all been represented in cringeworthy ways, some being much more recent than you might think. Sit back and be amazed as we countdown some of the most politically incorrect characters to have graced the pages of comic books with the 12 Most Offensive Comic Book Characters Of All Time. Lets play a game. Quickly think of every Irish stereotype you can. Four leaf clovers? Red hair? The color green? The good fortune bestowed upon people who hail from Ireland? Political violence dedicated to Irish republicanism? Imagine all of those things, but wrapped up in a single individual. Ladies and gents, meet Molly Fitzgerald, a hero in the Marvel universe who goes by the name Shamrock. With her fiery red, hair, green jumpsuit and clover symbol plastered across her chest, Shamrock fought the forces of evil by being really lucky. Seriously, her superpower was literally “the luck of the Irish." She’s so Irish, we’d bet that she got her powers by kissing the Blarney Stone, but apparently her militant IRA father prayed to bless his son (whose name was Paddy, because of course it was) with powers. Unfortunately, Paddy was killed by an IRA bombing and Molly was possessed by the ghosts of the innocent victims of war. These ghosts would then manifest themselves for short periods of time to grant Shamrock the luck she needed to turn the tables against her foes. Unfortunately, Shamrock slipped in a non-superhero related incident and broke her leg. Believing her luck to have run out, she hung up her tights for good. A member of the reality TV-starring X-Statix, Gin Genie was a mutant who could generate seismic waves, the power of which was a direct result of how high her blood alcohol content was. A particularly nasty drunk, Gin Genie would often target her own team members with her powerful seismic blasts, essentially making her more akin to that one friend who can't handle his/her booze and gets dragged out of the bar by the bouncer after starting fights with everyone. The existence of Gin Genie makes a joke out of alcohol dependence, and since she's essentially useless when she's not loaded, the character implies that being drunk makes you intrinsically better. DC deserves some credit for at least attempting to diversify their whitewashed superhero rosters, but their early forays were composed solely of exaggerated stereotypes that became the sole attribute of these characters, relegating them to one dimensional disposal red shirts. One such laughable attempt at injecting the Justice League of America with some Latin flavor was Cisco Ramon, otherwise known as Vibe. Vibe was a hispanic gangbanger from the mean streets of Detroit, because this was 1984, and non-white characters had to come from an impoverished and/or criminal background. Given his love of rhythmic gyrations thanks to his saucy Latin heritage, Vibe is able to generate powerful sonic vibrations; also, he's a pretty rad breakdancer, effectively turning the League into JLA: Electric Boogaloo. In recent years, however, Vibe has seen a resurgence in the DC Universe with expanded abilities, making him one of the most powerful beings in DC comics, as well as being featured as a main character on the CW's The Flash and Arrow, although he hasn't broken out the cardboard dance floor. Yet. A giant sentient egg that, for some reason, happens to be Chinese, this enemy of Wonder Woman is so blatantly racist it would make your grandmother blush. Created in 1965, Egg Fu was drawn as if the guy who did caricatures at the local fair really disliked Asians. 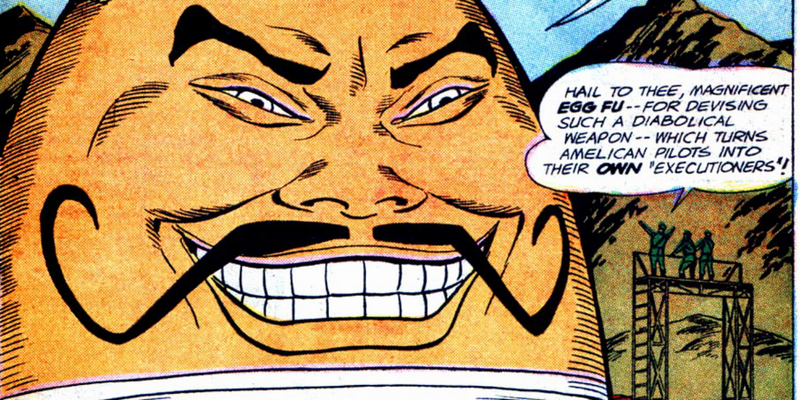 Another Asian supervillain, Iron Man's longtime foe, the Mandarin, has caught some flack over the years for his racist undertones, but he has absolutely nothing on Egg Fu. Not so much offensive, but definitely in bad taste, this throwaway villain only appeared in a single issue of DC's Doom Patrol. Obviously intended as a juvenile joke, the sheer absurdity and tastelessness of the character has seen Codpiece live on in infamy. Before adopting the Codpiece persona, this hapless unnamed man was unlucky in love. A series of blunders and misunderstandings leads him to believe that his romantic mishaps are a direct result of the paltry size of his manhood. Ultimately. he becomes totally preoccupied with the size of his member, culminating in the construction of a huge, mechanized codpiece that housed a myriad of deadly weapons including rockets and menacing drills, as well as a few comically oversized gag items like spring loaded boxing gloves. In a bizarre twist, after Codpiece robs a bank with his Transforming weiner cannon, Coagula (one of the first transgender characters in comics) manages to subdue him by using her powers to, ahem, liquefy solids. After being adopted by Caucasian parents, African-American baddie Tike Alicar did not understand why his skin tone was darker than theirs, so he began to obsessively wash his hands in an effort to clean the “dirt” off. This obsession with cleanliness/racial shame leads him to discover his mutant power, acidic sweat that generates an unknown type of energy. Ashley Crawford is a gorgeous fashion model with a body to die for. After discovering that she is a mutant, she gives up lucrative international modeling contracts in order to use her powers for good. With her ability to gain mass at a hyper-accelerated rate, Ashley becomes the superhero known as Big Bertha. As Big Bertha, Ashley is gifted with super strength and is nearly impervious, which she uses to protect America's flyover states as part of the Great Lakes Avengers. The only problem is that she is morbidly obese. So, in order to keep her day job of strutting her stuff down catwalks, Ashley has to ditch the weight, and fast. Luckily she can simply duck into the nearest bathroom and purge all of the extra poundage. Is thinner better? We're not sure, but one thing is definitely for sure, bulimia is never cool. We've mentioned Extrano before, mainly to point out how much potential this DC character would have had if it weren't for his unfortunate and flat out embarrassing story arcs. Considered to be the first openly gay superhero, the opportunity to create a compelling character who simply happened to be homosexual was wasted, as writers treated Extrano like a walking punchline. It was like Extrano was written by straight men who didn't mind the idea of gay people, as long as they never found themselves in a public restroom with one. As a result, Extrano, whose name literally means “strange” or “odd,” embodied every gay stereotype, including flamboyant behavior, a sassy attitude and a ridiculously gaudy costume. To make matters worse, Extrano contracted AIDS during his tenure as a superhero, most likely after he was attacked by a HIV positive vampire called Hemo-Goblin who was created by a white supremacist group to eradicate non-whites by having the vampire infect them with AIDS. Yikes. There are many female characters in comic books who use their beauty to their advantage. Some don't even have a choice, just take a look at Dansen Macabre, a cult member whose sensual dancing can hypnotize and even kill. Yes, she's essentially a stripper. Enchantress, despite having many powers and abilities in her wheelhouse, chooses to exploit her beauty in order to get what she wants, setting back feminist ideals for everyone! As an Asgardian, Enchantress began learning magic at an early age. After being expelled for being a little too flirtatious with the other students, she pursues her training in magic by seducing those in the know to get her hands on their mystical powers. She was particularly interested in mind control, a skill that her beauty only added to. She uses her feminine charms to string along Skurge the Executioner, another Asgardian who was hopelessly in love with her. Like a true sociopath, Enchantress uses Executioner's infatuation with her to her advantage, exploiting him in many of her schemes, stringing him along like a puppy dog. Did we mention that she's no friend to women either? She not only treats men like tools to get what she wants, just look at how many times she attempted to murder Jane Foster just for the opportunity to get into Thor's pants. Rumors of her inclusion in the upcoming Thor: Ragnarok have cooled a bit in recent months, but if she is indeed on her way to the Marvel Cinematic Universe, fingers crossed the character is a bit less degrading than her comic book counterpart. Looking as if someone had accidentally washed the Ku Klux Klan’s sheets with a really dope purple sweater, Hate-Monger first appeared on the pages of the Fantastic Four way back in 1963. A mysterious evil-doer whose name pretty much says everything you need to know about him, Hate-Monger popped up on the FF’s radar after holding a hate rally in New York City. Of course, Hate-Monger wasn’t just any old bigot off the street, oh no, he had a hate-ray, which was not a precursor to Haterade, but rather a ray gun that shot beams of hate that would inflict its target with pure, adulterated rage. After the Hate-Monger was defeated, he was unmasked and revealed to be a still alive Adolf Hitler. The objectification of women in comic books has been the subject of scrutiny and debate. Revealing costumes and implausible figures have often been cited as adding nothing to the characters other than blatant sexualization; a pervy way for immature fanboys to get their jollies off while reading comics. While there are many female characters who are incredibly strong and independent, it's hard to argue that they aren't deliberately designed to be sexually appealing. NYPD homicide detective Sara Pezzini is one of those characters who is both strong and engaging, but is drawn in a such a ridiculous manner, we're left hoping that her “costume” is a tongue-in-cheek jab at the objectification of women in comics. Sadly, we highly doubt that this is the case. When Sara stumbles upon a magical artifact known as the Witchblade, she is pulled into a world of supernatural intrigue. The Witchblade bestows its user with superhuman abilities, at the expense of its host's clothes. Yes, it literally rips the clothes off of Sara's body when she uses it. But hey, breasts! Besides looking like he just waltzed out of Studio 54, at first glance, Tyroc seems like a win for race relations, as one of DC's first black superheroes. However, if you were to take a peek at the character's brief history, you'd discover that his existence is less of a celebration of equality and more of a backhanded criticism of racial integration and civil rights. Prior to 1976, The Legion of Superheroes, a kind of time traveling intergalactic police force, featured exactly zero black characters. Blue skinned aliens were okay (as long as they had Caucasian facial features), but black characters, even non-speaking ones were completely devoid of any representation. That is, until Tyroc came onto the superhero scene to knock down the barriers of intolerance and oppression with his lame sound-based powers and super fly disco outfits! Just kidding, Tyroc was a total jerk who also happened to be a big fan of segregation. As it turns out, Tyroc was the superpowered champion of the fictional island nation of Marzal, whose residents were all black. Tyroc used his powers to enforce racial separatism on Marzal island, using them to shoo away any “undesirables” or to transport the entire island into another dimension courtesy of some Lost-esque mumbo jumbo. At least this terrible storyline cleared up where all the black people had been. Did we miss any of your most hated offensive characters? Sound off in the comments!